Introduce your students to the art of architecture. 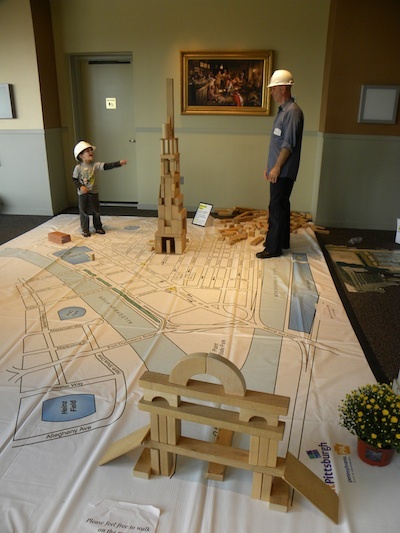 Borrow three hands-on activities from PHLF that explain the three goals of architecture. Use blocks to build a house for a mouse, a snake, and a giraffe. Students learn how the use of a building influences its design. Use wing nuts, bolts, and plastic pieces to build triangles and other multi-sided shapes and bridge spans. Students learn how structural elements— columns, beams, trusses and walls—help buildings and bridges stand up. Add decorative elements to a two-dimensional house and learn some of the words architects use to describe building details. Contact Karen (412-471-5808, ext. 537 or karen@phlf.org) to borrow these hands-on activities for a two-week period. PHLF will deliver them to your school. Fee: $125 for PHLF members, $200 for non-members. Refundable deposit required. In addition you may borrow a huge, vinyl floor map (12 ft x 16 ft) of Downtown Pittsburgh for a two-week period. 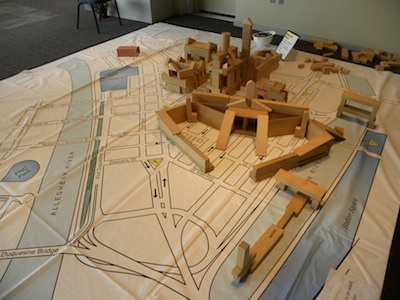 Students can use blocks, cardboard, or paper to construct buildings on the Downtown street grid. Fee: $25 for PHLF members, $35 for non-members. Refundable deposit required. If you’re only borrowing the map, please come to our offices to pick up the map and return it.